North has always been a technology company. This focus on technology and innovation was fostered by the company founder, Lowell North, who left a career in aerospace engineering in 1957 to strike out on his own, to make sails. North was the first sailmaker to leverage computer modelling and with the help of UC San Diego professor, Heiner Meldner, they were able to perform structural analysis using a computer-simulated wind tunnel — which saved them time and money. This allowed North to design and test their sails on the computer before they were built, giving them a significant advantage over the competition. North then developed a computer controlled laser plotter/cutter to increase the efficiencies of their production floor. Eric Wakefield is the Service Manager for the Portsmouth, RI North Sails loft. 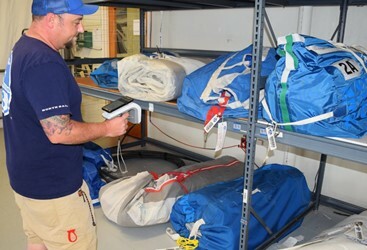 The service component of their business is significant with hundreds of sails, on a given day, being cleaned or repaired, often with tight deadlines. Eric needed to develop a better system to manage his sail inventory. His team was spending too much time maintaining the physical sail inventory and they struggled to keep it tight enough to meet the high customer expectations. Eric turned to RFID technology and worked with A2B Tracking to develop a real-time asset management solution leveraging both fixed and mobile RFID readers. The physical inventory that previously required multiple days to complete was now able to be accomplished in minutes with RFID and the A2B Tracking platform. Eric and his team now perform daily inventories of the entire facility, saving significant labor costs and improving their inventory accuracy to 100%.